The body of Laura Palmer is found washed up on a riverbank, wrapped in plastic. 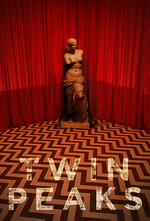 Special Agent Dale Cooper of the FBI heads to Twin Peaks to investigate the murder. Scheduling: I'll be posting three to four episodes a week as we lead up to the new season. I've labeled this a First Watch so we can go right into the new episodes. Spoilers: Because this is a "first watch," and there may be people who are only now watching the show (this was a me a few months ago), please avoid spoilers. Watching: Available on Netflix, Hulu Plus, Amazon Prime, and Showtime starting 4/8 on air and 4/5 On Demand. Thanks to codacorolla, whose formatting from the rewatch in 2014 I used for this post. So several of my colleagues have attempted to First Watch this because of Reasons, and the criticism I hear the most is that the show is an unsettling mixture of too earnest, too slow, and too weird. Fair enough! The state of the art of television in 1990 is far enough away that modern audiences used to confident, attention-grabbing pilots like those of Breaking Bad or Game of Thrones will find a slowly-burning mystery from twenty-five years ago not all that compelling. Even though it aired on one of the Big Four major broadcast networks, it was and remains not for everyone. Television has been accused of unnecessary violence since its early days, and this episode is the exception that proves the rule. The pilot depicts two types of violence: a wasteful, puzzling violence that rends and soils everyone and everything it touches, and the secondary effect of dull, confused adolescents asking "why" and receiving no answers. The one inexorably leads to the other. And yet, what little on-screen violent action the pilot contains is the second kind. The first kind of violence is seen only by its flotsam, in a way both familiar and alien to viewers inured to CSI-style forensic recreations. No boffins use specialized tools for blood-spatter analysis. No special guest stars struggle peri-mortem. Laura Palmer comes into our homes "dead, wrapped in plastic," preserving the pilot's Aristotelean unities of time and space, and only smiles at us in slow motion on a friend's homemade videotape. Like Narcissus, 1990 America looked at the screen within a screen and saw itself—a series of idyllic, pastoral images propped up and belied by polluting industry and pervasive violence. The sequences from this episode that stay with me are the first shot of Josie Packard gazing at herself in the mirror; initial scenes at Twin Peaks High School—the grooving kid, the deputies, the screaming girl, the principal's breakdown, all of it; Ronette Pulaski unsteadily crossing the railway bridge; Bobby Briggs driving away from the Johnson shack at top speed; Deputy Andy Brennan crying and denying at the railcar; and the melancholy melee between the bikers and the jocks at the Roadhouse, set to Julee Cruise's lament of forever-lost love. "Too earnest, too slow, and too weird" is pretty much what David Lynch's whole career is built on. I was too young for it when it first aired (in that I was a very nervous 11 year old prone to nightmares) but I find those three qualities incredibly endearing. That said, I do wish that they had split the pilot into two episodes for modern audiences. So I'm watching this with my 15 year old Kid in the lead up to the new series. Kid proclaimed almost everyone a douchy douche. After the first episode, Kid thinks either Audrey or James did it, but leaning towards Audrey. I thought everyone in Grease was awful except for Rizzo, and Audrey was the 90's Rizzo, so I thought that was an interesting observation. The grooving kid was my favorite part. He's what made me realize that I need to pay attention and not idly watch this while doing other things. I introduced Twin Peaks to a slightly older coworker a couple of years ago; he was a super rural kid who hadn't known internet until grad school, his contemporaenous Chinese gf didn't leave the mainland until her mid/late 20s. He got hooked right away and appreciated the second season, the gf had no idea why TP had any appeal at all. Myself, my best friend at college in the late 90's had the VHS boxed set and along with his gf we all religiously watched an episode every Sunday along with the X-Files (on cable, and The Simpsons and whatever was in between). This show was probably a strong influence on why they moved to Seattle after we graduated from college. My recall of my original reaction of the pilot was; well, this is an interesting story, and the people are "real" - like, folks' backgrounds that I know. Archetypes, but with (an unique sprinkle of) flavour. Yeah, we were all total stoners. Grace Zabriskie's anguished realization gets me every time. That is dead on, especially with her haircut in this episode (It gets longer after this). The atmosphere creation that happens right off the top is unparalleled, even before you know anything weird is going on, you *know* many weird things are happening here. Rewatching this today, it is kind of amazing that this became a national phenomenon, but then, so did Lost and Game of Thrones so who knows? I tried to like this, but couldn't. Kinda like Mad Men in that respect, actually. I don't mind slow burns at all. The Wire, to pick one example is pretty much just that, but there just wasn't a whole hell of a lot of mystery here and the acting is terrible. Like 80s network terrible, not even 90s network bad. At least in the first episode, the characters have no character, either. It's all cheesy stereotypes. Maybe that improves later down the line? The one thing I did like about it was the overall atmosphere. It was both creepy and believable, which is kinda hard to pull off, but that isn't enough to carry a show for me. Is there a more fixed schedule than 3-4 times a week? Or is it going to just show up when it shows up? I am at the mercy of the schedule of a 15 year old. Tuesdays and Thursdays are out (we had already watched the first episode) so I'm going to try my best for Monday, Wednesday, and Friday plus whatever weekend day the Kid is available. Kid has agreed to the schedule, and we just finished the next episode. So we're doing Monday, Wednesday, Friday and the weekend. The pilot showed a small community being put through the emotional wringer. When else did a TV murder matter so much to the other characters? I thought Lynch was really onto something there and found the subsequent weirdness disappointingly cartoonish. Like 80s network terrible, not even 90s network bad. At least in the first episode, the characters have no character, either. It's all cheesy stereotypes. I've tried to start watching several times only to nod off 15min in, but last night I watched this episode like a normal person and wow, I did not expect to be so affected. An interesting difference from other gradual-reveal shows that came to mind is that Lynch isn't world-building so much as world-excavating. I will say, having just watched the first season for the first time myself, if you're put off by the slow burn of the first season, it _does_ start paying off in dribs and drabs towards the end of the season, and then the 2nd season gets a lot more entertaining although less consistent.